Start the semester with a healthy mindset at the annual Fine Arts Wellness Day, running 11am-2pm on Wednesday, Jan 16 in the Fine Arts lobby. All Art History & Visual Studies, Music, Theatre, Visual Arts & Writing students are welcome to drop by to sign up for a free chair massage, enjoy free healthy snacks courtesy of UVic’s Nutrition Programming & Services, fill up your water bottles at our rejuvenating hydration station & learn about stress management and other wellness tips from UVic’s Office of Student Life. And don’t miss two great same-day wellness events happening just next door at UVic’s Interfaith Chapel: the Pet Cafe (2:30 – 4pm) and the LOL: Laughter Meditation (2:45-4pm), both of which happen weekly. 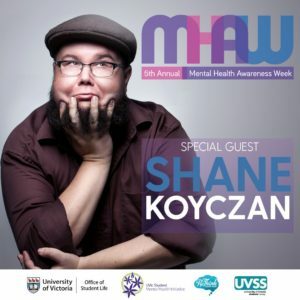 The Fine Arts Wellness Day is a proud part of UVic’s wider Mental Health Awareness Week, which runs Jan 14-18 and offers a wide variety of activities including free yoga, the famed (and also free) Vikes black-light yoga rave, free meditation sessions, a free keynote performance by noted spoken word artist Shane Koyczan and more! Think well, be well, create well!